Nely Galán, media mogul and founder of The Adelante Movement for Latina economic empowerment, is featured in “The Latino List: Volume Two,” an all-new sequel to the acclaimed 2011 HBO documentary “The Latino List,” debuting MONDAY, SEPT. 24 (9:00-9:45 p.m. ET/PT) on HBO and HBO Latino, in celebration of Hispanic Heritage Month. “The Latino List: Volume Two” spotlights a diverse range of notables from journalism, modeling, politics, sports, activism and business. These prominent Hispanic Americans discuss such subjects as the childhood inspirations that fueled their ambitions, how they achieved success, the evolving American cultural landscape they helped mold, the importance of preserving a distinct cultural identity for future generations to embrace and the challenges posed by discrimination. 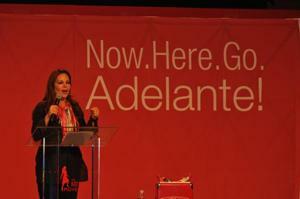 Nely Galán is a first-generation immigrant and self-made media mogul. She was the first Latina president of a U.S. television network (Telemundo). Galán is an Emmy Award-winning producer of over 600 episodes of television in Spanish and English, including the Fox reality series The Swan, and the first Latina to appear on The Celebrity Apprentice with Donald Trump on NBC.